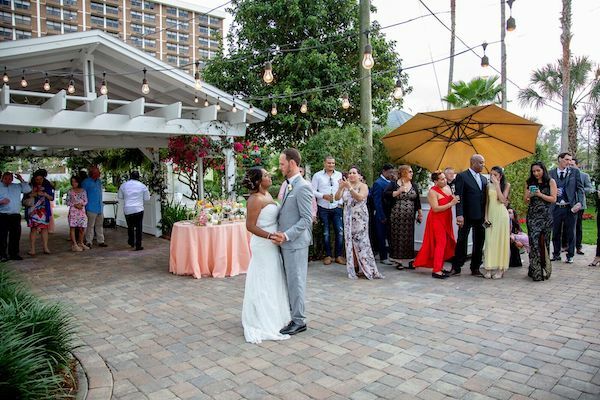 Congratulations to Tiffany and Jeremy who chose to host their recent Orlando wedding with our team at Celebration Gardens. 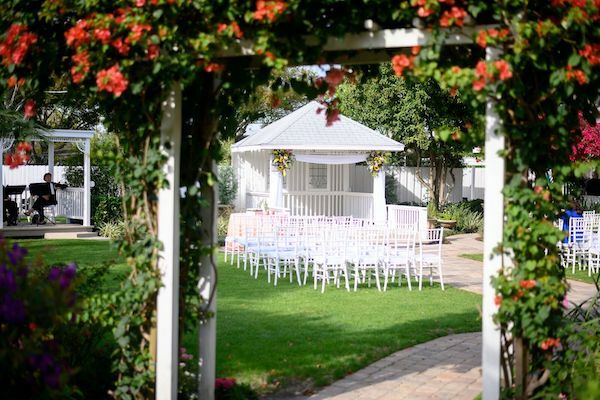 Our gardens were in full bloom and looked beautiful for their wedding ceremony. 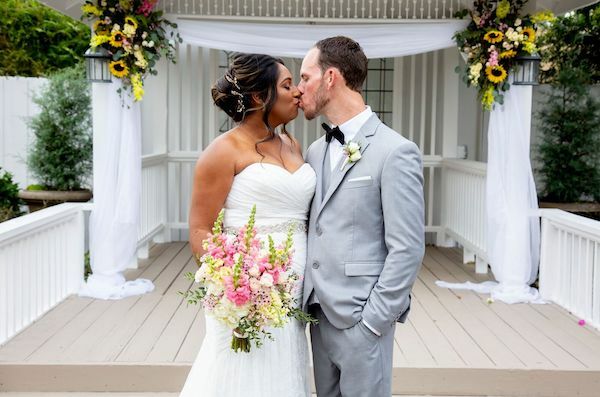 Our wooden wedding gazebo was swagged in white fabric with and adorned with floral touches of sunflowers and brightly colored flowers. The flowers by Atmospheres Floral Décor gave a fresh picked from the garden feel to Tiffany and Jeremy’s wedding. The wedding bouquets, boutonnieres, and centerpieces all contained snapdragons in pink and yellow, white spray roses and soft pink wax flower. 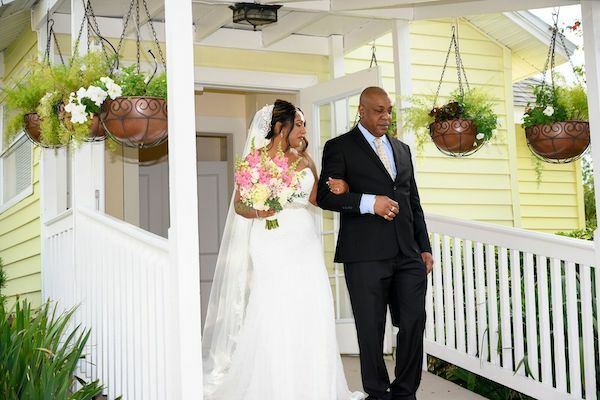 Live music by Eclectique Productions set the stage as Tiffany made her way from the Bridal Cottage to exchange her wedding vows with Jeremy in an intimate wedding ceremony officiated by Peg Prikosovich. 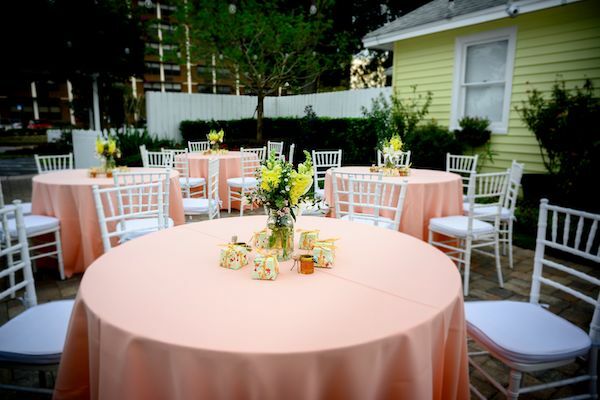 The outdoor wedding reception tables for the couple and nearly fifty wedding guests were draped in light pink, with shades of peach, colored linen which were paired with white garden chairs, and oversized clear glass jars bursting with fresh, colorful spring flowers. Tiffany and Jeremy added decorated jars of honey and gifts wrapped in floral patterned paper to continue the garden party vibe. 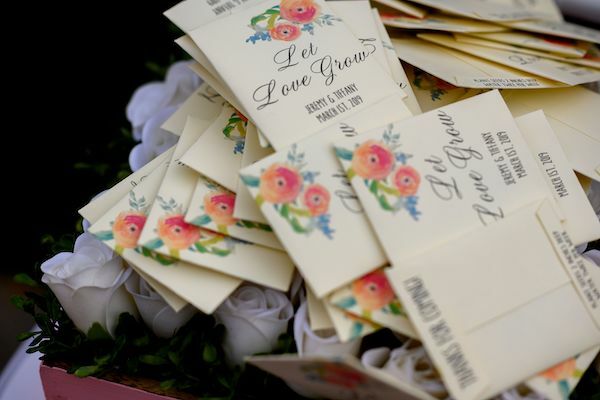 Guest also went home with seed packets, to plant at home, decorated with pastel flowers as well as Tiffany and Jeremy’s names and wedding date. After their first dance under a canopy of market lights, Tiffany and Jeremy cut their incredible two-tiered naked wedding cake by Its Tasty Too. 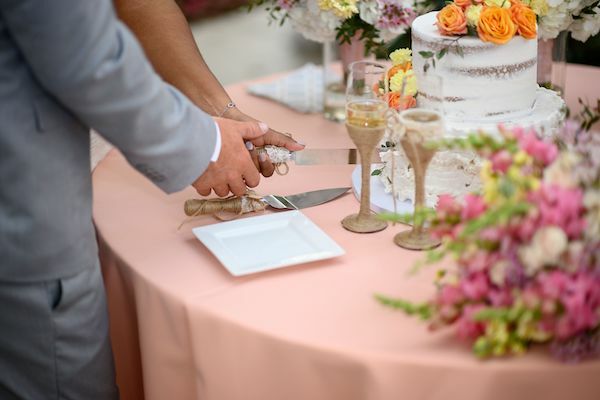 Their cake cutting set and custom toasting flutes were adorned with a natural jute fiber melding them with the natural elements of the garden wedding. 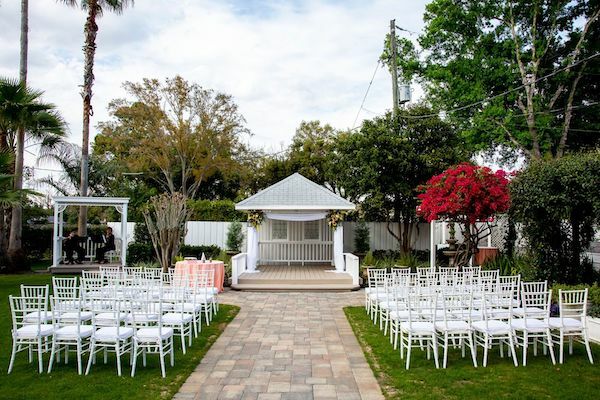 Contact our Celebration Gardens team to discuss your spectacular Orlando garden wedding, to secure your wedding date and to find out more about our fantastic Celebration Gardens Preferred Vendors.